Most times, the only decision customers have to make at a café is whether it’s going to be latte, cappuccino or Americano. That’s changed. At the newly-opened Flying Squirrel Micro Roastery and Café in Koramangala in Bangalore customers have to choose their coffee. Is it to be Parama, their ultimate, Sattva, pure and organic, Aromatique, Clouds in my Coffee or Sun-Kissed? Is it to be a pour-over, espresso or Americano, cappuccino or latte? For summer, the Flying Squirrel is also serving some of these fine coffees as cold brews. This warm, welcoming café, done up in shades of coffee, is the creation of third generation Coorg coffee planter Tej Thimmaiah and adman-turned-coffee entrepreneur Ashish D’Abreo. They have been growers and roasters since 2013 and have now opened the Flying Squirrel which, is a micro-roastery and café, where they can interact with customers, showcase their artisan coffees which also retail online (www.flyingsquirrel.in) and also conduct tasting sessions. Yes, tasting coffee is an engaging art, not unlike tasting wine, and signals the arrival of a new and evolving coffee culture. When you taste the Flying Squirrel coffees, sourced largely from its own and a few select estates, you learn to tell whether a brew is full-bodied or light, whether the acidity is rounded or sharp, whether there’s a mild sweetness to it. Ashish D’Abreo says it’s a fascinating journey and can add to the enjoyment of your cup of coffee. 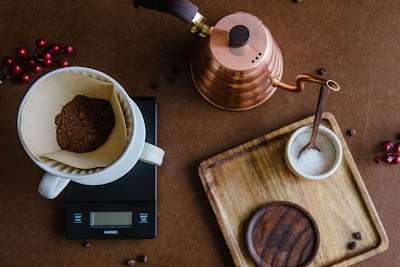 Speaking of the pleasure to be derived from coffee, he baulks at talking about it only in terms of ‘caffeine kicks’ and ‘highs.’ “Anything that has caffeine will give you a kick, but that is not the aim here,” says this passionate coffee enthusiast. He wants customers to enjoy the nuances of coffee, going back to how it was grown, processed, roasted and served. It all starts with the bean and how it’s treated on the journey to the cup. The Clouds in My Coffee variant, for instance, is processed naturally, travels to Mangalore to absorb sea-side moisture-saturated air that creates a distinctive bold, deep flavour. Sunk-Kissed, the single-estate coffee, is processed using the pulp sun-drying method, which allows the fruitiness of the pulp to be drawn into the coffee. Then, there’s the roasting. Ashish says the Flying Squirrel coffees are all light-roasted as opposed to the dark-roasting which most cafes and coffee chains resort to, destroying the nuances. Technology and experience enable the Flying Squirrel team to deliver fantastic, perfectly roasted coffees from their gleaming machine. It’s ground then, again to different degrees of fineness or coarseness, to suit different methods of brewing. The pour-over is an intricate art, with controlled amounts of water being poured through the coffee at regular intervals. The Flying Squirrel cappuccino aims for perfection with the milk being raised to just the right temperature, so the foam is light and creamy, not ‘cooked’. Another star coffee here is the Nitro Brew, a cold brew infused with nitrogen making it chilled, light and airy and perfect for hot weather. Serving coffees that are this carefully made also requires a knowledgeable and skilled staff. Ashish invests a lot of time and effort in staff training to ensure they can explain the qualities of each coffee to customers and also prepare it flawlessly every time. The effort has clearly paid off and the Flying Squirrel team infuses their passion for freshly ground coffee into every cup. And that makes it very special.